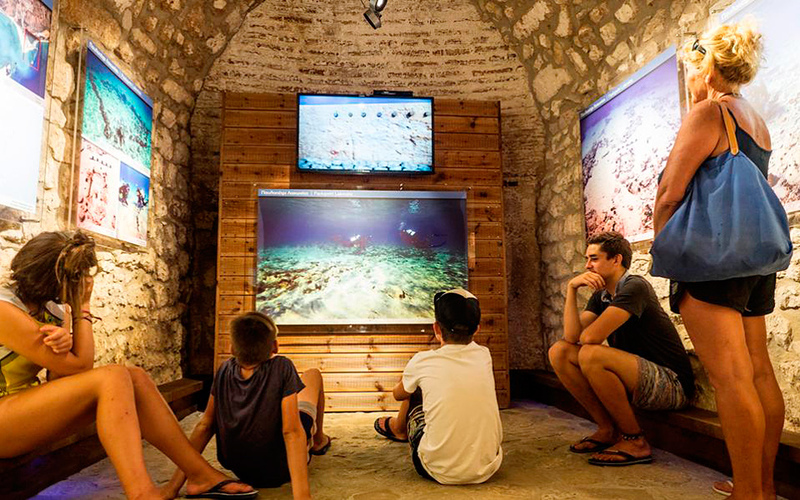 Niokastro is home to the only museum dedicated to the Ephorate of Underwater Antiquities. It was still early in the morning when we reached Pylos, a pretty seaside town on the southwestern coast of the Peloponnese, just as its residents were starting to stir. 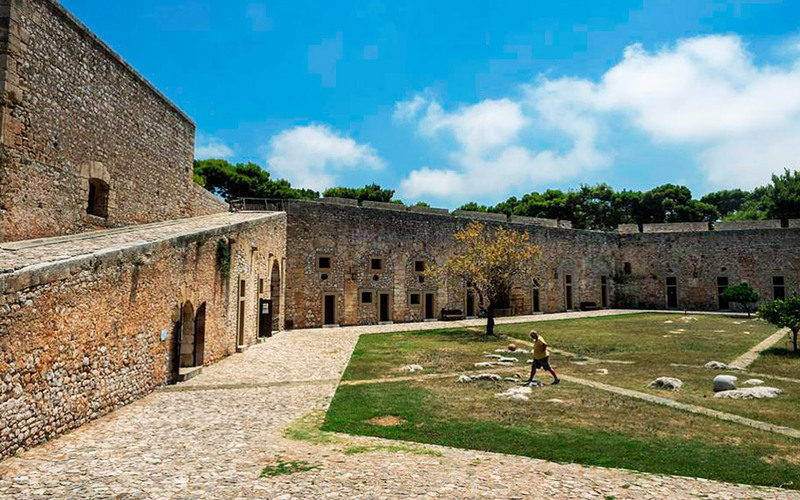 We left behind the main square with its big, shady plane trees and headed to Niokastro – the “New” Castle – which overlooks Pylos from a hill at the southern end of its impressive natural harbor. The 15th-16th century Mediterranean fortress is typical of its era, with an outer wall surrounding the settlement and the acropolis, the latter of which was contained within a hexagonal fortress, the last line of defense from marauders. Together with early-bird tourists, we walked through the castle gates to meet the head of the Ephorate of Underwater Antiquities, Angeliki Simosi. She is just the right person to show us around the collection of exhibitions that opened in Niokastro in 2012 and represent the only place in the country where you can get a comprehensive view of Greece’s underwater treasures. Restoration and remodeling work has been carried out on the castle’s Makriyianni Rampart and Pasha Building, which today are among the structures used to showcase the work being done by the Athens-based ephorate. “Visitors can admire fascinating finds, learn about the location of major shipwrecks and also about our conservation work, and much more,” said Simosi. We started our tour at the Pasha Building, with a new addition to our group, Ilias Kouvelas, a Pylos native and a diver with the Ephorate of Underwater Antiquities for the past 35 years. He made his first dive when he was 17 during excavations of the Pythagoreion on the island of Samos, and since then he has explored almost every wreck covered in “Sunken Journeys, Human Exploration: Important Finds from the Seas of the Peloponnese,” a marvelous ongoing exhibition which was set up under the ephorate’s supervision back in 2012. 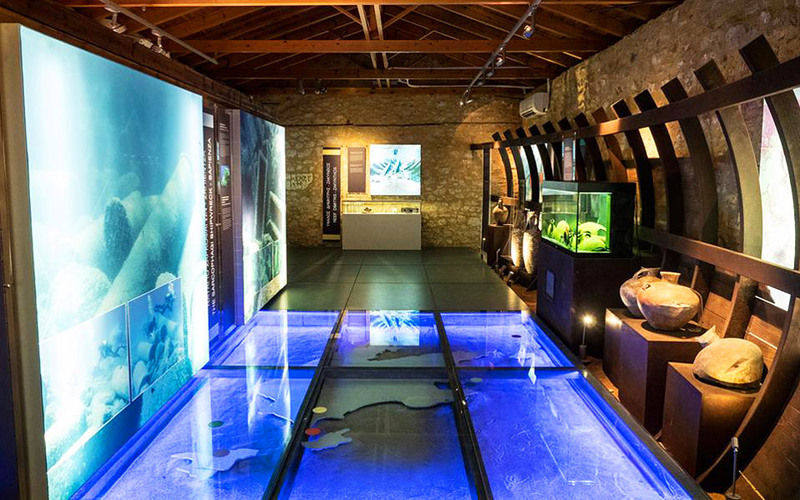 In the main hall of the Pasha Building, which has been designed to resemble an ancient ship hull, a huge map of the Peloponnese on the floor helps visitors locate the show’s seven wrecks, which lie off the shores of Cephalonia, Zakynthos, Kythera and Methoni and date from the prehistoric to modern times. They include the shipwreck off Cape Xi in Lixouri, Cephalonia, with its impressive Hellenistic-era statues. “The sculptures were discovered by holiday makers in the summer of 1980, just 300 meters off the coast. We responded immediately and brought them up before they could fall prey to antiquities thieves,” says Kouvelas. The sculptures were likely pillaged from a Greek temple and loaded onto a ship that was sailing to Italy when it sank. Moving on, our attention was drawn to a compass and stone plaques adorned with fossils of fish. These came from the Mentor, the ship laden with sculptures prised from the Parthenon on the orders of Lord Elgin, which sank off southern Kythera en route to England.We headed for the exhibition “Sunken Settlements of the Peloponnese” at the Makriyianni Rampart, one of seven bastions around Niokastro, which has been transformed into a pretty museum showcasing architectural elements that confirm many of the testimonies of ancient travelers. “Here we present findings from three sunken settlements in the southern Peloponnese,” said Simosi. “Pavlopetri, which is in the region of Laconia, was a prehistoric settlement that was discovered in 1970. A few inspections were held, but in 2009, the British School at Athens proposed that we work together to excavate the site. Indeed, we discovered a very extensive settlement, which also contained a mansion, meaning that an aristocrat lived there. “The second settlement, also extensive, comes from the Middle Bronze Age and is today located on the coast of Methoni. Important buildings have been found there too, while extensive geological research has shown that there are remains of the settlement beneath the sand as well. 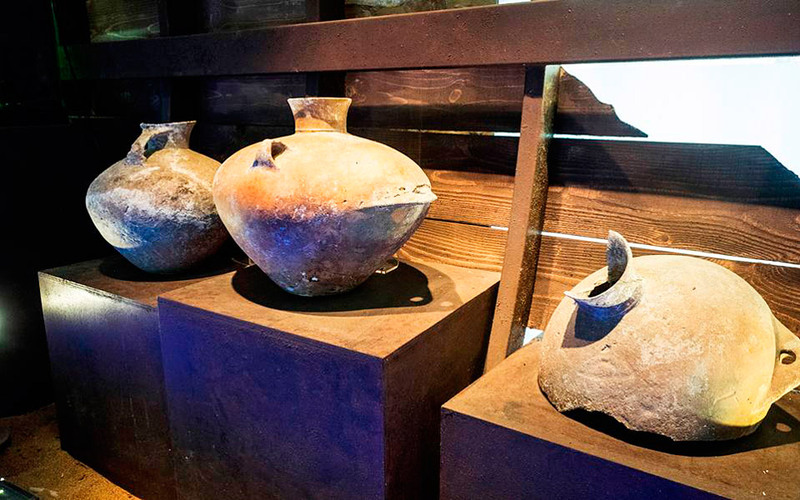 We have some very important discoveries from Methoni, such as a jar used in prehistoric times to inter a child, which would then be placed in the home. The last stop of our tour takes us to the acropolis. Simosi and her associates have taken advantage of six cells and filled them with antiquities, while a seventh is used to display diving equipment used in excavations through the ages: old suits and metal detectors, decompression chambers, electronic pumps used to fill oxygen tanks, and much more. The passageways of the acropolis have been used to set up the open-air exhibition “The Greek Seabed Tells its Stories,” comprising mainly photographs and complemented by finds from different parts of Greece and different eras. It’s a bit of a potpourri of the ephorate’s research in the last decade – but is by no means insignificant. “The future of Greece’s archaeology lies in underwater archaeology, because it seems that we’ve seen what we can from the land,” said Simosi. One of her department’s greatest challenges now is creating underwater archaeological sites that can be visited by the public. Plans are already in the works for sites in Pylos, Magnesia and Attica. We left Niokastro and headed back down toward the center of Pylos, where an impressive neoclassical mansion seems to dominate the historic bay of Navarino. It is the former home of Olympic champion Costis Tsiklitiras, whose second floor has been conceded by the municipal authority to the Ministry of Culture. Here, the Ephorate of Underwater Antiquities has set up an exhibition of items from the collection of French philhellene Rene Puaux (1878-1937). A war correspondent and writer, Puaux was a witness of the turbulent developments in Greece in the first half of the 20th century and conducted seven trips around the country. He also collected artworks on the subject of the 1821 Greek War of Independence, which he then donated to the Greek state. The Tsiklitiras mansion now houses Puaux’s collection of maps, swords, pistols, portraits, engravings, medals, manuscripts and letters from the time of the Battle of Navarino and the Greek liberation.